Buy Eye Glasses Online. Rx Frames For Less - Rx Frames N Lenses Ltd. Thinking Of Buying Eyeglasses Online? Welcome to Rx Frames N Lenses Ltd. We are a family-owned, domestic business with over 15 years of experience in the optical field. We would like to take this opportunity to answer your questions about purchasing your eyewear online. We offer you quality name brand prescription eyewear at affordable prices, outstanding customer service, guaranteed right to your door. Why pay high retail prices when you can order them online with the peace of mind of a secure shopping environment. Rx Frames N Lenses sells only 100% authentic genuine eyewear, no imitations or fake products. Check out our frequently asked questions section to answer any questions or concerns you may have. Also, visit our "About Us" section to get to know us, our company and experience. How to order eyeglasses online? How long will my eyeglasses take? What is my pupillary distance(PD)? How do I choose the correct frame? What do the numbers on the frame mean? Can you put lenses in my old frame? What are the best lenses? What are single vision lenses? What type of guarantee do you offer? 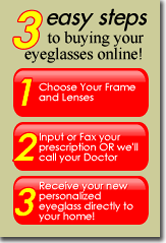 How to order eyeglasses online! Ordering eyeglasses online is much easier than you may think. Knowing some basic information will make ordering your eyewear online easy, affordable, fast and convenient. Our goal is to help you make this process as easy and enjoyable as possible. Once you have your required information, our user friendly shopping cart will take you step by step through the four step process making it very easy to order your eyewear online. Step one: Obtain your prescription from your local optometrist / optical shop. Check out the "How do I obtain my prescription" FAQ section. Step Two: Choose your frame from our extensive line of optical frames. We carry an extensive variety of eyeglass frames in many price ranges, styles and colors. To order a frame only simply choose frames only in the Lens drop down menu. Step three: Choose your lenses from our wide range of single vision, bifocal, and progressive lenses. You also have the option of scratch resistant and ultraviolet (UV) coatings. We carry every lens to suite your particular needs. Step four: Checkout is easy. You can pay for your eyewear using our secure easy to use shopping cart system. We accept most major credit cards and also utilize Pay Pal. We ship your new eyewear in it’s own protective case along with a cleaning cloth, guaranteed right to your door within 7-10 business days. Your eye doctor or optician keeps your prescription on file and must provide you with your prescription information. This is required by law. You do not have to feel obligated to purchase your eyewear from them. You can purchase your eyewear anywhere you choose. The staff here at Rx Frames N Lenses Ltd. can contact your doctor or optician for you and obtain your prescription. Please provide your doctor’s name and phone number and we will be happy to do it for you. Fill out our online prescription form provided during checkout and we will call to verify your prescription. Below is a copy of a sample prescription. Please ask your doctor to write in the full prescription including your pupillary distance (PD). Please allow 7-10 business days for the delivery of your prescription eyewear. Delivery time may vary by the complexity of your prescription. Ordering anti-reflective coating, rim-less frames, and tints can take a few extra days to complete. However, we strive to ship your order within 7-10 days. Should there be a delay due to the complexity of your order we will notify you immediately. Usually you will receive your order sooner with standard prescription orders. Non-Prescription Sunglasses and Frames only orders. You non-prescription sunglasses and frames only orders are typically shipped faster. You should expect to receive these types of orders within 5-7 days. Most orders are processed with our suppliers within minutes of receiving them. Once an order has been placed electronically online, we will allow you up to 24 hours to cancel the order. Orders cancelled after 24 hours will incur a 20% cancelation fee. Thank you for your cooperation. The frame has been shipped to us by the Manufacture after 24 hours. This fee covers shipping and handling to and from the Manufacture. The information contained in your prescription is the lens power required to correct your vision problems. It consists of sphere power, cylinder power, cylinder axis, bifocal addition, and prism power. Your prescription may or may not contain all of these numbers. However your pupillary distance (PD) measurement is needed to complete your order. Note: If your prescription is more than one year old, we at Rx Frames N Lenses recommend that you update your prescription by visiting your local Optometrist. Sphere: Correction for long or short sight. This can be a plus ‘+’ or minus ‘-’ value. Cylinder: This is a correction for astigmatism if you have one. This can be a plus ‘+’ or minus ‘-’ value. You may or may not have a value of cylinder in your prescription. Axis: The axis for which the correction for astigmatism needs to be set at. This will be present only if you have a value in cylinder. This can be a number between 1 and 180. Addition: ("Add") Additional plus power in the lower portion of a multifocal lens, that is required for near vision in progressive, bifocal, or trifocal lenses. Prism: This is not normally filled in on your prescription. Occasionally, when the two eyes are not properly aligned and looking at the same thing, prism can be ground into the lenses to re-align them. Base: "Base In", "Base Out", "Base Up", and "Base Down" are the four positions for prism in eyeglasses. Orientations between the four positions can be specified by using combinations of horizontal and vertical prisms in the same lens. Pupillary distance (PD): Your PD is the distance from the center of the pupil (black spot) in one eye to the center of the pupil in the other eye. Your PD measurement improves the positioning of your lenses within the eyeglass frame. 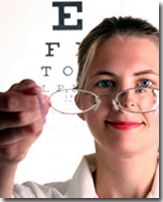 Be sure that you ask for your PD measurement when you have your eyes examined and have it added to your prescription. Your PD is the distance from the center of the pupil (black spot) in one eye to the center of the pupil in your other eye. Your PD measurement improves the positioning of your lenses within the eyeglass frame. Be sure you ask for your PD measurement when you have your eyes examined and have it added to your prescription. The PD in this example is 58 millimeters. W e recommend you get your PD measurement with your prescription or have your local optician measure it for you. Most optical shops will do this free of charge or for a small fee. To measure your own P.D. simply put on a pair of eyeglasses and have a helper use a NON-PERMANENT marker and mark a dot in the center of each pupil on your eyeglasses. to the left pupil (center) and measure straight across to the right pupil (center). Be sure to keep the ruler straight and measure in millimeters. With hundreds of frames in all shapes, sizes, and colors to choose from, picking the right frame for you can be confusing. However this guide can help you determine which frames will fit and look best on you by your face shape. Once you determine the shape of your face and the size of your frame the rest is easy. By wearing a contrasting frame shape, you will compliment the shape of your face. Frames should enhance the shape and features of your face. The first number 47 is the lens diameter. The second number 19 is the nose bridge width. The third number 130 is the earpiece length. Note: Lens height (B Vertical) must be a minimum of 28mm to accommodate a bifocal or multifocal lens. Note: There is an acceptable deviation of 2mm in these measurements. Therefore, you do not have to be exact. How to choose a frame to suit your face shape? This guide is for general purposes only and you should pick your eyewear based upon your individual taste. However most people generally fall into the following categories. Since the shape of your face is well balanced, you can wear most frames. A soft angular or rectangle shape frame can make your face appear longer and thinner. 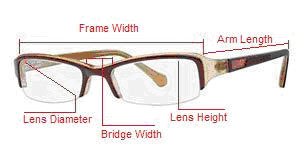 Frame suggestion: Wider frames with angular, rectangular or square shaped. You can reduce the sharp angles of a square face by choosing soft, curvy frames such as ovals or cat-eyes. Widen and shorten the appearance of an oblong face by wearing frames that do not extend beyond the widest part of your face. Round or square shaped frames will look best on you. Your face will appear wider and shorter. Choose a frame that is slender, rounded or squared but avoid a frame that has a greater width at the top. This would depend on your prescription. Generally you want your lens to be thin and lightweight for comfort and be cosmetically appealing. A lens with one focal power, usually a correction for near-sightedness, far-sightedness, and/or astigmatism. A bifocal is added to the single vision lens for near vision. There are now two focal powers in the one lens. These lenses feature change from distance vision to near vision providing an infinite range of powers in between. This now gives you distance, intermediate and reading without a visible line. This is commonly refered to as "no-line bifocals". These lenses are great for the high plus “+” lenses. They reduces the center thickness of the lens, making the wearers eyes appear more realistic in size. The reduced center thickness of the lens makes it thinner, lighter and more cosmetically appealing. High index lenses are great for high minus “-” lenses. These lenses allow you to have one of the thinnest lightest lens possible, making them more cosmetically appealing. Can you put lenses into my old frame? Yes we do make lenses for your old frame. Contact us with the type of lenses you want along with your frame type whether it is a rimless, semi-rimless, full rim and material such as plastic or metal. We will issue you an order number to put on the outside of the box when sending us your frame. Our payments are processed through PayPal, the trusted leader in online payments. You can use your PayPal account, Visa, Mastercard, American Express or Diner's club, without a PayPal account. It is safe, easy, secure, and when you use PayPal, your financial information is not stored on RX Frames N Lenses servers. Here at Rx Frames N Lenses Ltd. we value our customers and strive hard to be fair to all of our customers. We believe our exchange, warranty and defective product return policies are fair and necessary to keep our prices low and quality high for everyone. Please be sure to provide accurate information to us to help prevent delays and or errors. Thank you from the staff here at Rx Frames N Lenses Ltd., we do appreciate and thank you for your business. We offer a one-time exchange only policy on the return of any eyeglass frames or sunglasses within 30 days of the shipping date at no charge. The shipping of your second frame is also free shipping back to you. All original packaging, frame bags, certificates, and warranty cards must be returned in resaleable condition. Non defective products that are returned and not exchanged will be charged a 15% restocking fee. Others charge a flat fee plus shipping. We simply charge a percentage to cover shipping and handling to and from the Manufacture and the original free shipping to our customers. If you paid extra for upgraded shipping this charge is not included in the 15% restock fee. Prescription lenses are custom made and therefore non refundable. If your lenses are defective or incorectly made we will remake the lenses at no charge and credit you the return shipping. Frame exchanges with prescription lenses will be credited 50% off the original lens price toward the cost of new lenses in the event the lenses will not fit your new frame choice. If you simply do not like your eyeglasses for any reason we will issue you a store credit of 100% for the frame and 50% for the lenses. You must notify us within 7 days of receiving your eyeglasses. Most frames have a Manufacture warranty for one year from the date of purchase. A frame warranty is for Manufacture defects only, not damage induced by the wearer or conditions such as breakage, heat, moisture, etc. Any warranty request that does not meet these requirements may be refused and shipped back to the original shiiping address. We will not be held responsible for refused warranty replacements not received by the customer. When returning a frame under warranty in the event a frame is discontinued by the Manufacture and we can no longer get the frame, we will replace it with a different frame at equal or lesser value. We will not be responsible for your prescription lenses. If your prescription lenses were made by us we will remake your lenses into the new frame at 50% of the original cost. We guarantee 100% accuracy on all prescription lenses or they will be remade at no charge. All prescription eyeglasses are inspected and pass a rigid quality control inspection. The lenses are checked for prescription accuracy by our licensed Opticians along with frame and lens alignment. Lenses have a one year warranty against Manufacture defects, such as peeling of coatings. Damage induced by the wearer, such as rough handling, dropping, scraping and improper cleaning will not be considered Manufacture defects. All of our lenses come with a scratch resistant coating, however no lenses are scratch proof and require proper cleaning and care. Crizal Anti-Reflective coatings have a two year warranty against Manufacture defects. Any lens warranty return that does not meet these requirements may be refused and shipped back to the original address. We will not be held responsible for refused warranty warranty replacements not received by the customer. In the event that you receive a defective product, request an RMA number within 3 business days of receiving your product. We will replace it for the same product, size, color prescription, etc. and reimburse your return shipping up to $5.99 USPS Priority shipping cost. In most cases we will send a prepaid return label to your email address that you can print and attach to your return package, then simply drop it in the mail back to us. If you claim a defective product and want it replaced with a different product, size, color, prescription, etc. the product will be considered an exchange and our exchange policy will apply. The defective product must be returned with all original packaging materials, including unused warranty cards, and instruction booklet. Items not returned in original condition will be returned. Before returning a product for exchange or refund, please obtain a RMA ( Return Merchandise Authorization) number. E-mail us with the reason for the return or exchange at eyewear@rxframesnlenses.com. We will email you a RMA number. RMA numbers expire after 30 days. Returns must be post marked within 15 days of receiving your RMA number and received by us within 30 days of the RMA number issue date. Rx Frames N Lenses Ltd. Returned products must be declared “Returned Item Without Value” or we have to charge you for any duties incurred by US Customs.